With the game, certainly, and perhaps a season, teetering on the brink, the Boone Central Cardinals fought out of a 10-point halftime hole to score their first victory of 2011 Saturday, edging West Holt 48-46 in Albion. With Huskie Sebastian Hansen hitting a pair of 3-pointers and scoring 10 points, and Boone Central struggling offensively, West Holt built a 27-17 advantage by intermission. The Cardinals came out of the locker room with a different look, however, using renewed defensive intensity while taking the ball aggressively to the basket on the offensive end. BC outscored the visitors 18-7 in a 3rd quarter burst to edge ahead. The teams seesawed in the 4th before Boone Central built a six-point edge behind two Beau Bremer field goals, four free throws by Brett Temme and driving buckets by Colton Mazour and Derek Gentrup. 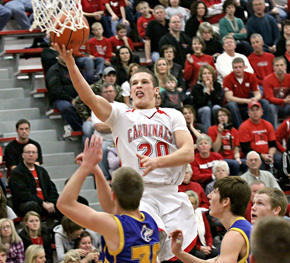 The Cards then hung on by their fingernails as Hansen nailed his fourth trey of the game. BC missed 4 free throws in the final 20 seconds, but escaped when Hansen’s long 3-point attempt bounced off the front of the rim at the buzzer. “We talked before the game that attitude is everything for us,” commented Boone Central Coach Dan Zoucha. “In the first half, that attitude was not where it needed to be.